Presidio Santa Maria de Galve was a Spanish presidio built on a high bluff overlooking Pensacola Bay in 1698 to ward off French encroachment into Florida. The Presidio included a separate log fort named Fort San Carlos de Austria, a church, and a village. The fort was the first European fortification established in the Pensacola area and was named for King Carlos II. Much of the surrounding village was burned in 1707 when Fort San Carlos de Austria was besieged by a large Indian force. 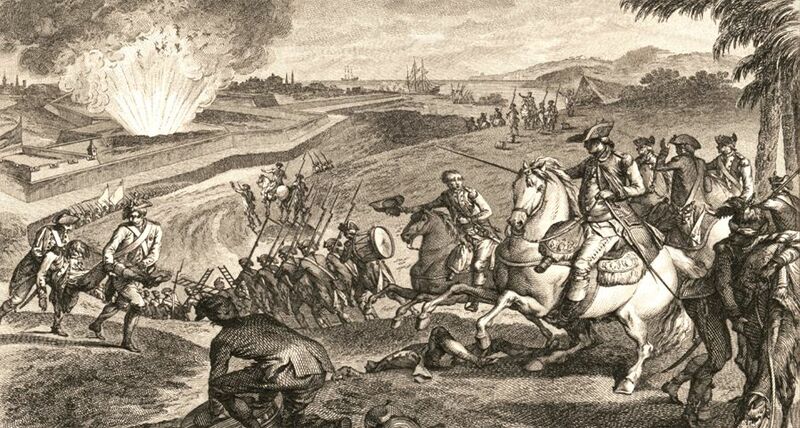 The Presidio grounds were occupied by the Spanish until May 1719 when it was by Governor Bienville of French Louisiana, with a fleet of ships and a large ground force of Indian warriors. The French occupied the property until 1722 when the Spanish regained control by virtue of the 1720 Treaty of the Hague. The French burned the Presidio and the fort as they departed. The Spanish decided not to rebuild at that location and built a new Presidio Isla Santa Rosa Punta de Siguenza on Santa Rosa Island. The new Presidio was destroyed by a hurricane in 1752. A third site was selected and named Presidio San Miguel de Panzacola in present-day downtown Pensacola. From 1763 to 1781, Pensacola was under British control but was recaptured by Spain in 1781, marking the beginning of the last period of Spanish rule. In 1787, the Spanish built yet another fort on the original site of Fort San Carlos de Austria. The high bluff on which it was placed was called by the Spaniards “Barrancas de Santo Tomé” and they called their new fortress Fort San Carlos de Barrancas. The Spanish collaborated with British forces during the War of 1812, which led Andrew Jackson to move into Pensacola in 1814. The occupying British then retreated but blew up Fort San Carlos de Barrancas before they left. The site was later the location of other forts, most notably the 19th century Fort Barrancas, which still stands. In 1996 the University of West Florida began historical and archaeological research at the “First Pensacola” site, which led to uncovering the fort, village, and church. 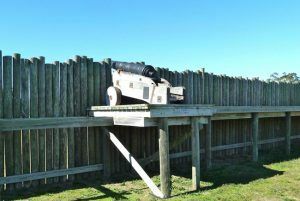 A partial fort reconstruction and interpretive exhibits are displayed at the site today, located northeast of Fort Barrancas on the Naval Air Station in Pensacola, Florida. The exhibits explain the history and archaeology of the site.